Need A/C fixed. Not blowing cold air. Website says you have 24/7 service, but I can't find a way to contact you today. We had three humidifiers under the house attached to our units. All three are no longer working. We would like all three removed and then replace two of the three. Insulating crawl space. No concerns at all. Upstairs AC not working. Main floor working fine. 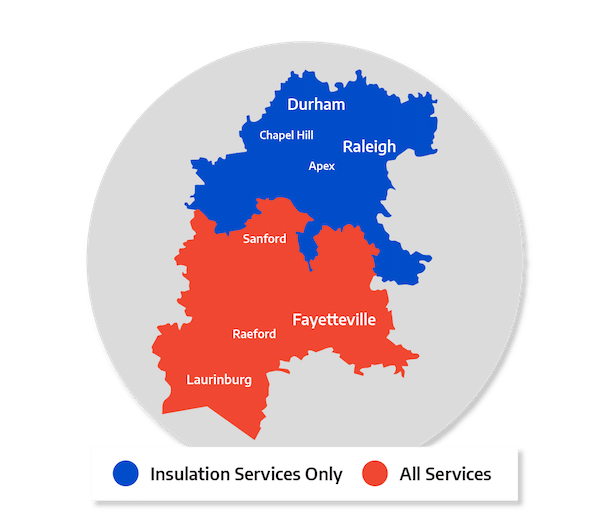 I recently moved back to my NC home and am struggling to pay monthly Duke Energy bills. Was wondering if sealing or insulating, depending on cost, could help me with cooling and heating costs. Small home. Approximately 1000 square feet. Have had Air Specialty service and they say unit is in good working order. Very frustrated and constantly sweat in my home. Any ideas/help is greatly appreciated. House was built in 2007. Need to add additional insulation to attic. Also - bonus room upstairs has batts for insulation. I would like to have those removed for spray foam as that room is always hot. Interested in a quote for a 2 ductless units for our basement and sunroom. We are current customers of your services. "Heat pump failed just prior to Thanksgiving with a..."
"I have always heard good things about you. I have known..."
I've got a problem with the dryer duct cleaning you performed at 225 Adams Circle 06/11/2018. We just recently moved into the home and have only used the dryer twice. The duct is still clogged at the exterior of the house and it appears like it is mostly attic insulation. I've received the invoice, but not willing to pay the amount due until this problem is solved. I'm not using my dryer for fear that it will start a fire. Need estimate to replace furnace and air conditioning unit . Unit is located in attic located thru bedroom closet. Currently have 3.5 ton unit. Want upgrade to 4.0. Would like to get estimate ASAP. Need an estimate to install a ductless AC for an approx. 220 sq ft sun room. Thanks! AC runs but never cools the house. We need an evaluation of our A/C and Heating units. I believe they are over 20 years old and may need to be replaced. Would like to get a quote for duct cleaning. Previous owner had pets and there were no filters on the intakes. Additionally, just had floors refinished and lots of sawdust was in the house.